Emptyset are UK-based duo James Ginzburg, co-founder of the Tectonic label, and Paul Purgas, who take their name from a complex mathematical term basically meaning zero. 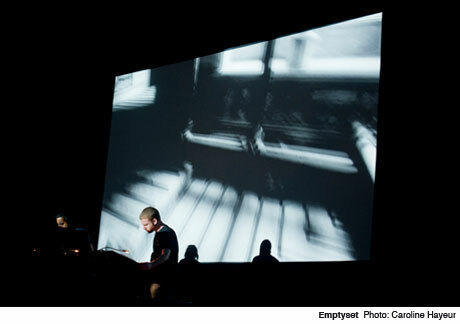 Their Montreal performance, one of the first at this year's MUTEK festival, was a collaboration with visual artists Clayton Welham and Sam Williams. Emptyset performed in front of a large-scale projection screen, on which grainy images of a slow tour around the inside of an old brick building were projected, interrupted by blasts of visual static like a television on the blink. The set started off as it meant to continue with a dark and tension-filled sound and ribcage-shaking levels of sub-bass. The glitchy sine-wave-rich drones were occasionally interrupted by transient techno beats that fell away as quickly as they came. Like Raster-Noton with a touch of Underground Resistance filtered through the hotbed of the current UK post-dubstep bass scene, it became a powerful set from a group to watch out for.